The Walter Rand Institute for Public Affairs has selected its second Faculty Fellow for the year, Dr. Michael S. Hayes. An assistant professor in the Department of Public Policy and Administration at Rutgers-Camden, Dr. Hayes’ WRI Fellow’s research will follow on the Institute’s well-received report Is South Jersey Getting it’s ‘Fair Share’ of Public Goods, exploring whether there are disparities in the distribution of state aid to local governments and school districts across and within regions in New Jersey. His past research includes examinations of the effects of traumatic community events on student achievement, tax and expenditure limitations on school districts’ fiscal decisions and educational outcomes, school district income taxes on property values and educational resources, and summer activities on learning rates for English language learners and students with individualized education programs. Dr. Hayes was drawn to partner with WRI because of his interest in researching how local governments make managerial and fiscal decisions and the Institute’s strong working relationships with local, elected officials and employees throughout New Jersey. Dr. Hayes received his PhD in Public Administration and Policy from the School of Public Affairs at American University in 2014. 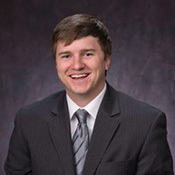 He was selected as a ’16-’17 Emerging Education Policy Scholar by the American Enterprise Institute and the Thomas B. Fordham Institute and was awarded the 2013-14 Emerging Scholars Award by the National Association of Schools of Public Affairs & Administration (NASPAA). Graduate students of Rutgers-Camden also selected Professor Hays as the recipient of the Jay A. Sigler Award for Teaching. Professor Hayes grew up in Carroll County, Maryland and moved to the area after studying at American University and Towson University. His wife, Alisa—a speech-language pathologist who works with children and young adults with severe learning disabilities—shares his passion for education policy and outcomes. Page last updated by Senator Walter Rand Institute for Public Affairs at 11:13 am April 4, 2017 . This page was printed from http://rand.camden.rutgers.edu/2017/03/21/hays-faculty-fellow/ at 4:24 PM Monday, April 22, 2019.